Oh hooray, hooray for this short story anthology! 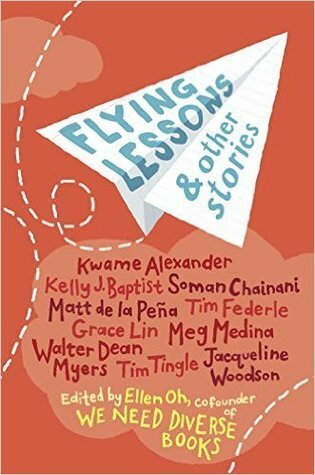 Edited by Ellen Oh, who cofounded the "We Need Diverse Books" movement, there is so much to love in this collection. As a teacher, I am always looking for strong mentor texts and shorts stories are perfect because they can give a class a shared reading experience, without taking as long as reading a novel together. Usually, short story collections start out with the best story and have a varying level of quality throughout. While I did think that Matt de la Pena's story, "How to Transform an Everyday, Ordinary Hoop Court into a Place of Higher Learning and You at the Podium," was the best, I loved them all. De la Pena's story is all about hard work and lessons learned through basketball; this will be appeal to my male students so I'll be keeping it in my back pocket! Another standout was Somain Chainani, whose sumptuous title story is about an extravagant grandmother who takes her nerdy grandson for a European adventure. I loved it and was eager to read more by the author, only to learn he wrote The School for Good and Evil that some of my students rave about and I avoid because of the cover. Lesson learned (again). I want this for my library so that students can dip in and out of the stories that interest them, so I can use them as mentor texts for writing lessons, and so I can interest readers in authors they might be hesitant to check out in book form (Grace Lin's books look big to developing readers, but her sweet story here might entice them to brave the pages! ).